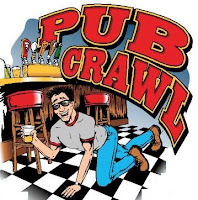 Drunk Nothings: PUB CRAWL...........TELL EVERYONE!!! We will start at Ace's high at 3 pm which is located at 551 Dorchester Ave South Boston, MA 02127(right next to the Andrew Square Tstop)A list of the addresses to the rest of the bars will be handed out at the first bar. Did Somebody Say Scandalous Photos??? Now what do you look forward too?